Make this You've Got Mail! 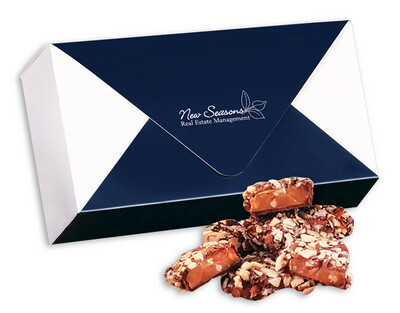 a part of your holiday gifts or thank you giveaways for a memorable sweet reward. Imprint area: 2 1/4" x 1"
Dimensions: 7 1/8" x 3 5/8" x 2 1/8"
Price includes imprint foil-stamped in white. Here's a piece of mail that will definitely get their attention! The elegant, blue and white envelope-style gift box is filled with 36 pieces of our signature English Butter Toffee, one-pound. Deliver this box as a thank you, stock it in the office store, or give it as a holiday present. Clients and employees will know who gifted this treat with your logo foil stamped in white on the lid.